By peeling the glass off buildings, rolling back the tarmac on roads and sucking the water out of rivers to expose the hidden infrastructure beneath, Strip the City brings a completly new sight into six major cities. Visit London, Rome, Dubai, Sydney, Toronto and San Francisco, striping them layer by layer, exploring the secrets of their Geology and the state of the art techonology that keeps tehm running. As you explore what lies beneath each metropolis, you come face to face with the engineering and environmental challenges that this huge endeavours need. Explore how engineers in London are updating its huge underground Metro network, how workers in San Francisco are building earthquake proof skyscrapers and bridges, and how buildings in Dubai can weather sandstorms and survive in the searing desert heat. 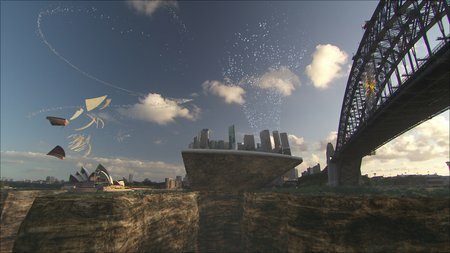 The more you dig up, and as you peel back the concrete layers, a new alien landscape is revealed: discover underground volcanoes, hidden rivers, subterranean cliffs, fragile fault lines, and ancient catacombs - geological wonders that play a surprising role shaping the cities and lives of the people above. This series reveals a world never seen before - an alien geological universe normally hidden under tarmac and concrete...a landscape of unprecedented wonder, turbulence and scale.